Nottinghamshire County Cricket Club has announced that accountancy and business advisory firm, Smith Cooper, have become sponsors of Trent Bridge’s New Stand. The New Stand, which was opened in 2008, becomes the Smith Cooper Stand in a five-year partnership; the Club’s first ever sponsorship deal of its kind. Smith Cooper are one of the largest locally owned, independent accountancy firms in the Midlands, working for clients across the UK from offices in Nottingham, Derby, Birmingham, Leicester, Ashbourne, Buxton and Telford. Nottinghamshire County Cricket Club’s Commercial Director Justin Tose revealed that, with two flagship partners in Smith Cooper and John Pye now on board, the Club’s position with regards to sponsorship has never been healthier. “When the New Stand was built, it was always the Club’s intention for it to be available for a naming rights sponsorship,” he said. “For us it was about finding the right type of partner that shares our values. Smith Cooper’s James Bagley, Managing Partner of the Nottingham office, revealed that continued investment in the local community emphasises the firm’s commitment to the city. “Our firm celebrated our 30th anniversary last year and our presence in Nottingham has been instrumental in our success,” said Bagley. “Having already worked alongside Nottinghamshire County Cricket Club as a business partner and sponsor of the Club’s apprenticeship programme, we’re proud to have strengthened that relationship for the next five years. 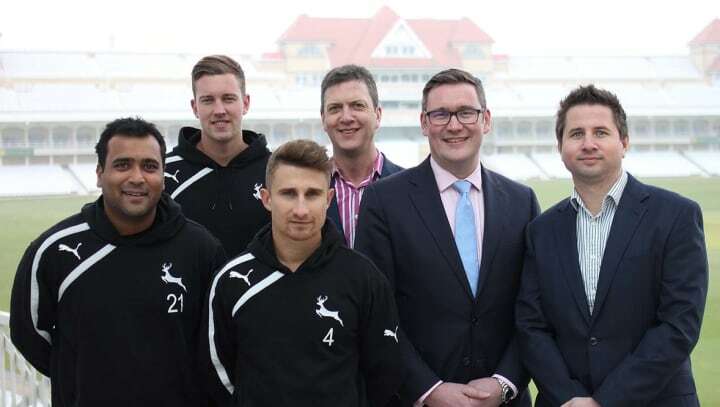 Pictured above left to right: Samit Patel, Jake Ball, James Taylor, Nottinghamshire County Cricket Club Commercial Director Justin Tose and Smith Cooper partners Dan Bowtell & James Bagley.